Compact binoculars? The market is full of interesting models easy to keep handy when you’re travelling by bike. We reviewed some of them for you, highlighting the main optical characteristics. Enjoy your reading. Have you ever brought some binoculars with you? You don’t think they could be useful? You’re wrong. [Un pochino forte. Direi: We think differently] Their usefulness is undeniable. They allow you to analyse the route, see useful details closer, admire in detail animals and scenery, look at the moon, practise bird watching, follow events, concerts… If your trip is for the most part in natural surroundings, do not leave them at home. If you’ve never had a pair, now is the moment to consider purchasing one. 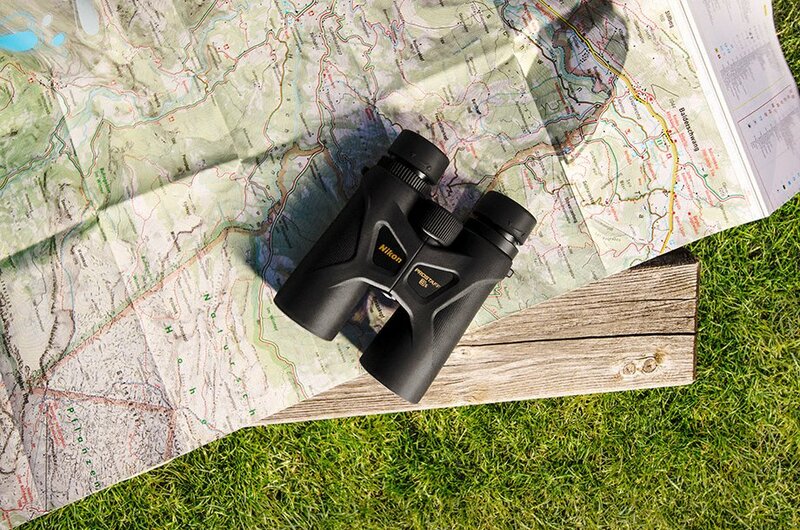 As anticipated earlier, there are a lot of binoculars presenting features suitable for bike travellers, which we could sum up in lightness (we start from less than 300 grams), small size, possibility to regulate the dioptre, brightness, focal length, sturdiness, water-resistance. Binoculars are basically an optical instrument that magnifies objects which are far away through a series of elements positioned in parallel. The front lenses pass the ‘captured’ image to a prism, which has the function of straightening the image, and then to the two eyepieces. you need to consider models with BAK-4 prisms. Focus is for both eyes thanks to the movements controlled by the central knob. Numbers like 7×35 or 10×50 indicate the enlargement factor (the first) and the diameter in millimetres of the front lenses. Dividing the second number by the first we obtain the ‘exit pupil’ value, i.e. The diameter of light that reaches the eye, always expressed in millimetres. The higher the enlargement, the lower the brightness. And also the frame is more difficult to maintain still as it has a smaller field of vision. Basically if you want to go beyond 10x enlargement you’d better have a tripod with you. A good compromise could be 8×25 or 8×30. If you want brightness with good enlargement you will need to choose a model with front lenses of a greater diameter, and consequently greater weight. These parameters, in the case of pocket binoculars are unavoidably object of compromise, given the lightness, small size and simple handling. Optics aside, the bike traveller must see if the eyepieces can be distanced correctly and if they do not create problems with eyeglasses. Also the focus distance can be important. This is determined by the central knob and the dioptre corrector (both present in each of the proposed models) in case an eye doesn’t see as well as the other. While selecting the models to propose we paid attention to the price related to the actual usefulness of the binoculars. The price range is between 80 and 220 euros, with 2 well-out-of-range models (let’s call them outsiders): the Canon with image stabiliser and the ZEISS which sell at 300 and 360 euros respectively (on average). Check also the guarantee’s lifespan, element that says a lot about the reliability of the product. You can find that the guarantee covers 5 years, in some cases even 10! Almost all the products presented have a rubber outer coating and are waterproof. This means the inside is filled with nitrogen, an inert gas that helps keep the vision free of mist. Declared water resistance up to 2 metres for 5 minutes.